Have you overindulged during the holidays? Or for that matter, the entirety of 2011? 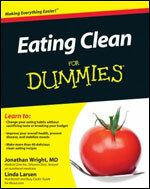 Check out the book, Eating Clean for Dummies by Jonathan Wright, MD and Linda Larsen. (613.2 W951). Eating Clean for Dummies encourages the reader to avoid processed foods (i.e, “anything that comes in a box and has a label”) in favor of whole foods: fruits, vegetables, lean protein, and whole grains. Authors Wright and Larsen draw upon their considerable expertise in nutrition, food science, and nutritional healing to explain the many benefits of clean eating, and the plethora of negatives associated with eating processed and fast foods. Every aspect of how to alter your lifestyle is covered: grocery shopping, cooking methods, stocking your kitchen, eating clean on the go, even how to restore the family dinner to your schedule and make it fun. “Clean” recipes for meals, desserts, and snacks are also included so readers can immediately put clean eating into practice. As is typical of the Dummies series, this book is well organized with a detailed table of contents, subject index, and icons within the chapters highlighting main ideas. Readers can quickly find the sections that interest them; at no time does the information feel overwhelming. With a writing style as clean as the eating plan it promotes, Eating Clean for Dummies is an easily readable, persuasive, and thoroughly informative work. Need something hilarious, yet inspiring? Read “I’m with Fatty: Losing Fifty Pounds in Fifty Miserable Weeks.” By Edward Ugel. We often hear women’s stories of weight loss; here’s a book from a guy’s point of view. His hilarious, tell-it-like-it-is writing style will keep you reading and laughing. Ever wonder what a colonic cleanse is really like? You’ll find out here! You may not want to try everything Mr. Ugel did to lose weight, but it is a great, fun read. Other helpful titles: Eat Clean Diet Recharged by Tosca Reno (613.042 R418); Cook Yourself Thin (641.5635 C771); How to Never Look Fat Again by Charla Krupp (746.92 K94); The Food Matters Cookbook by Mark Bittman (641.3 B624). This entry was posted in Recommendations, Uncategorized and tagged cooking, eating clean for dummies, health, recommendations by ccld. Bookmark the permalink. Had not heard of either book so thanks for the heads-up. Wonder if they are “kindle-friendly”.